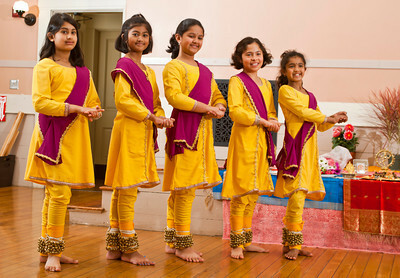 In these classes young students learn such fundamentals as: pranam, tatkar and footwork patterns, technique, rhythmic structures, recitation, hand gestures, stances, spins, facial expressions. Elements of storytelling and music are included, along with information about the cultural influences and history of Kathak. Kathak is among the eight major classical dances of India. The word Kathak is derived from kathak meaning “the art of storytelling.” It is also synonymous with the community of artists known as Kathakas, who would use dance, music and mime to bring to life the great scriptures and epics. From its early form as a devotional expression, Kathak gradually moved out of the temples and into the courts of the Hindu maharjas and the Muslim nawabs. In the Hindu courts of the vast semi-desert of Rajasthan, Kathak developed in the Jaipur gharana (school), a regional style emphasizing the technical mastery of pure dance. To the east, in the court of Wajid Ali Shah, the dance emphasized dramatic and sensuous qualities with with the refinement characteristic of the Lucknow gharana. Today, the art form has evolved into a dance presentation characterized by fast footwork, lightning pirouettes, rhythmic complexity, dramatic storytelling, improvisation and poetic expression. One of the most dynamic and far-reaching artists to have emerged from modern India, Pandit Chitresh Das has influenced the art form world-wide. Trained from the age of nine by his guru Pandit Ram Narayan Misra, Pdt Das was schooled in both the Lucknow and Jaipur schools of dance. Pdt. Das continues to explore the boundaries of Kathak technique and performance, including developing the innovative technique of Kathak Yoga. As a committed guru, he has trained many dancers and founded the Chhandam School of Kathak, one of the largest Indian classical dance institutions in the world. For a detailed biography of Pandit Chitresh Das, please click here. The Chhandam Institute of Kathak Dance (Chhandika) is a 501©(3) non-profit organization dedicated to maintaining and contributing to the rich tradition of Kathak dance. 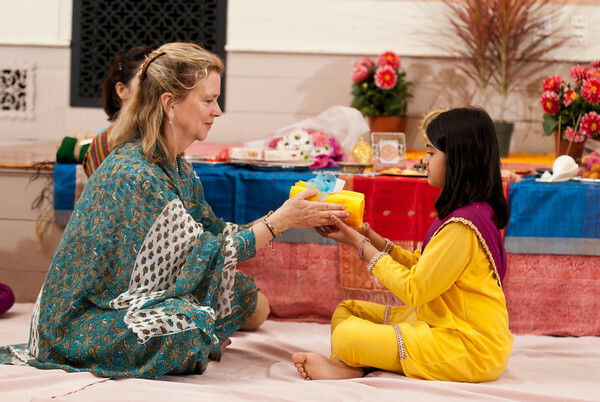 Based in Massachusetts, Chhandika was founded in 2001 by Gretchen Hayden, a senior disciple of Pdt Chitresh Das. After studying for over 20 years, performing as a principal soloist in the Chitresh Das Dance Company and teaching at the Chhandam School in California, she moved to Boston in 1992 and established kathak classes in the greater Boston area.. Ms. Hayden has also initiated accredited Kathak dance courses at Tufts University and Wellesley College and is a regular lecturer at MIT. For a detailed biography of Ms. Hayden, please click here. We accept checks and all major credit cards. A $30 bounced check fee will be charged for all returned checks. Any payment made after the designated deadline of the session for any class will be subject to a $25 late fee. Family discounts are given to those who have a family member attending the same, or any dance class at the studio. The teacher will announce this at the beginning of the session and through emails. Refunds and Credits: Classes will not be pro-rated for your absences planned or unplanned. Credits and refunds may be issued under limited circumstances. Requests for such must be made in writing and approval is at the sole discretion of Chhandika Branch Directors. Special circumstances: If a student has to miss part of session he/she has paid for due to an injury or family emergency, 50% of that tuition can be applied as a credit to the following session but cannot be carried forth to any other sessions. Initial registration should occur prior to the start of class. You will be required to fill out pertinent documentation and make payment before attending any classes. This includes a liability waiver, photo and video policies. Classes can be made up at Chhandika’s other locations. Please contact your Branch Director to confirm the best time and day of class to attend. If for any reason you decide you would like to withdraw from a group class, please discuss this with your branch director. A refund may or may not be deemed. Should there be any cancellation or changes to your regularly scheduled class time due to snow, we will do everything possible to notify you via phone and email contact information that you have provided to us. Additionally, all class changes and cancellations will be posted on our website at www.chhandika.org. For short notice cancellations, such as an ill instructor, Chhandika will do its best to email or call the students to inform them of the cancelation.